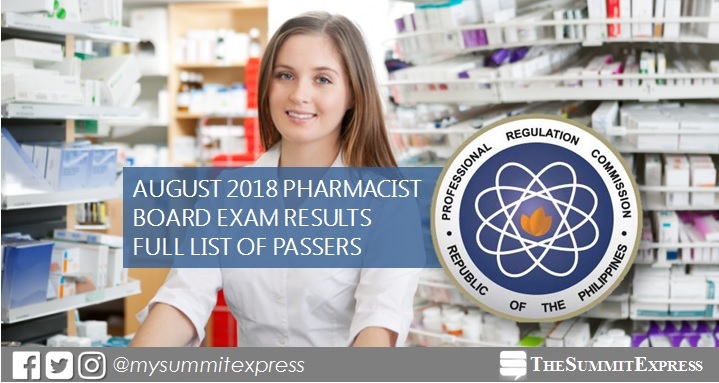 MANILA, Philippines – (Updated August 8) The August 2018 Pharmacist board exam results, which include the full list of passers, top 10 (topnotchers), top performing school and performance of schools are available here as officially released on Wednesday, August 8 or in three (3) working days after the exam. As announced, 2,927 out of 4,230 passed the exams. The Professional Regulation Commission (PRC) conducted the second board exam for pharmacists this year on August 4 and 5 in Manila, all regional offices; Zamboanga. From August 13 to August 20, 2018, registration for the issuance of Professional Identification Card (ID) and Certificate of Registration will be done on-line. Please go to http://online1.prc.gov.ph and follow instructions for initial registration. Pharmacist board exam's verification of ratings (passers, non-passers and removal) can be done online. Pharmacist board exam covered the following subjects: pharmaceutical chemistry, pharmacognosy and practice of pharmacy (August 4); pharmacology-pharmacokinetics, pharmaceutics and quality assurance/quality control (August 5). According to PRC Resolution No. 2017-1068, the target release of Pharmacist board exam results is on Wednesday, August 8, 2018 or in three (3) working days after the exam. In the same period last year (August 2017), PRC released results in just two (2) working days. A total of 2,784 out of 5,079 passed the examinations. Saint Louis University (SLU) topped the schools with 97.27% or 214 out of 220 passed the exams. In the June 2016 exams, results were also out online in 2 working days. PRC named 1,406 out of 2,784 who have passed the tests. San Pedro College (SPC) - Davao City was the lone top performing school after garnering 88.14 % passing rate or 104 out of 118 passed. We advise takers to monitor announcement of results starting Tuesday, August 7.